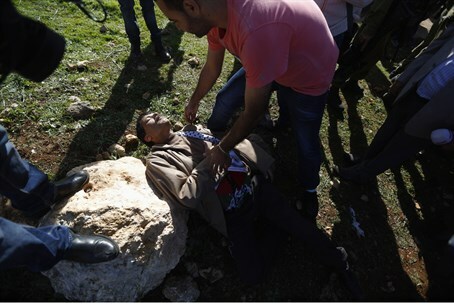 Iran says "assassination" of Ziad Abu Ein proves Israel's "criminal nature". Washington, meanwhile, calls for a "fair probe". Iran and Turkey on Wednesday condemned Israel over the death of senior Palestinian Authority minister Ziad Abu Ein, while the United States called for an Israeli probe of the incident in which he was killed. “Repetition of such crimes perpetrated by the Israeli regime have been included in reports of independent international human rights organizations and will give the Palestinians stronger determination to liberate the occupied territories of Palestine from the Israeli occupation and will further boost their national unity,” said the Foreign Ministry’s statement. Turkey's Foreign Ministry condemned Israel over the incident as well, according to the Today’s Zaman newspaper. The Ministry expressed condolences to Palestinian Arabs in a written statement and said the incident should be investigated objectively. In Washington, State Department spokeswoman Psaki said the United States was "deeply concerned" by the death of Abu Ein and called for the Israeli investigation into the incident to be "swift, fair and transparent." Abu Ein, 55, was a convicted terrorist who previously held the post of PA Deputy Minister of Prisoners' Affairs. Arab media claimed Abu Ein died after being "beaten" by IDF soldiers, but footage from the event proves that he suffered a heart attack and remained untouched while refusing IDF assistance that could have been life-saving. He was handed a life sentence in Israel in 1982 after being extradited from the United States in 1981 over the murder of two Israelis in Tiberias in 1979. Abu Ein planted the explosives which killed the two - Boaz Lahav and David Lankri. But he never served his life sentence over the callous murders - he was released in the Ahmed Jibril prisoner swap deal in 1985, just three years later. Earlier Wednesday, the UN special envoy for the Middle East Peace process, Robert Serry, urged Israel to conduct a "prompt, thorough and transparent investigation" into Abu Ein’s death. UN chief Ban Ki-moon added that he was "deeply saddened" by the "brutal death" of Abu Ein. EU foreign affairs head Federica Mogherini, too, demanded an "immediate" inquiry. "Reports of excessive use of force by Israeli Security Forces are extremely worrying: I call for an immediate, independent investigation into... Abu Ein's death," she said in a statement. "I expect all sides to exercise maximum restraint at this time and to avoid all actions that would further raise tensions," she added.